Lucy: Is it time yet? Me: You asked me that a minute ago. The answer is still no. 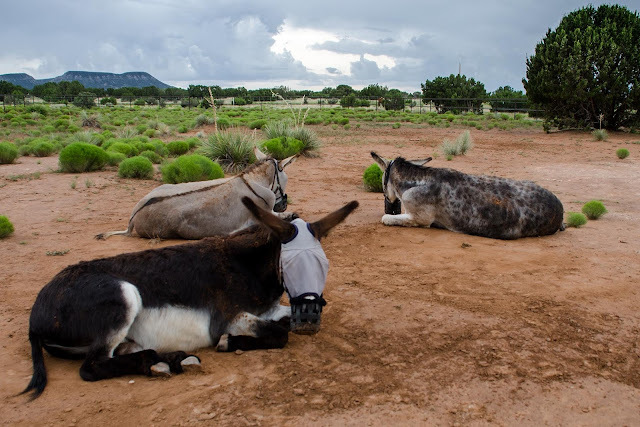 It's 7:00 p.m., it's still summer, and my donkeys are still in their masks and muzzles. They're hating me about now. 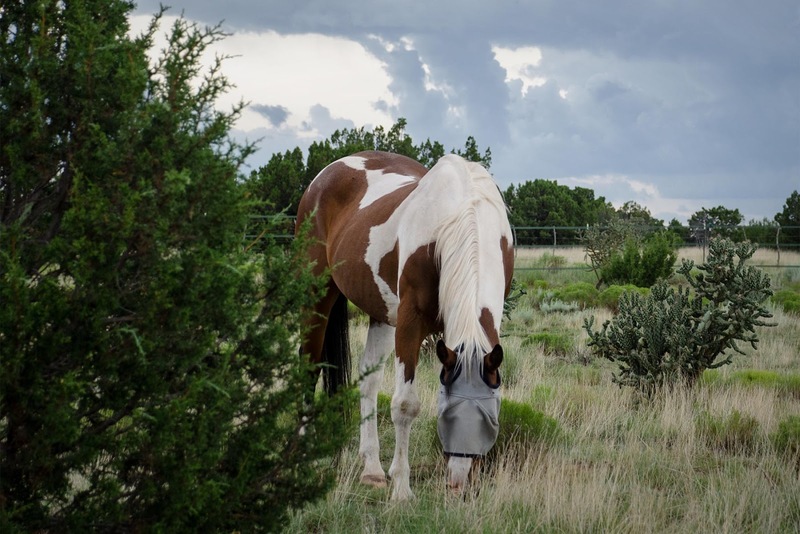 The masks/muzzles go on at 6:15 a.m.
and come off at 8:15 p.m. It's the new normal. his stomach acid balanced and his ulcers will heal faster. Thank goodness there's no need to "torture" Smooch or Johnny! 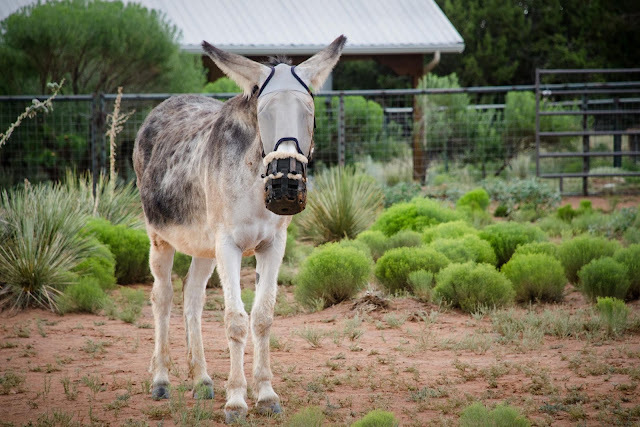 As to the donkey/burro "victims" of your care, I sort of feel their pain, but I definitely feel yours even more. Although--they surely must love you at 8:15 p.m.! 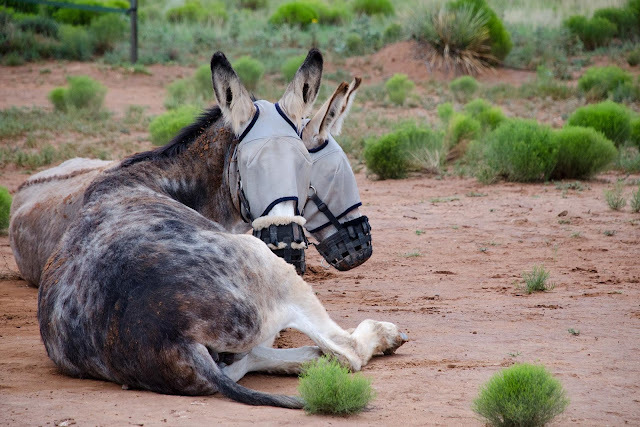 I read that donkeys and mules should not wear grazing muzzles,they are very adapted to the desert grazing... they only need to be restricted (by limiting time in pasture) when they are in a more lucrative environment such as deep lush grass, donkeys eat and can digest fibrous material and this keeps their systems in good condition. This was written by Dr.Faith Burden Head of the Veterinary Projects Dept Of the Donkey Sanctuary Devon, You can read it here. Everybody is happy including the cat! So well behaved. Aside from the "is it time yet" litany that I am sure starts much too early. So good to see Hank back home and taking his own place in the line up. Loving the hands free camera too. Johnny just has to lead you back tto where you need to be next. My Jag seldom lets me walk across the room without following him. I didn't realize Lucy had so many freckles. Too cute! They only show up once she sheds her winter coat. I love them. I love your new camera because it gives me the feeling of being right there, of being you in fact! and what a nice roll Johnny chéri! I think that George was watching you take off Alan's stuff so he could try to do it tomorrow! hee hee! Lucy's dapples are wonderful, she almost has a pattern like a giraffe. Is it my iPad, or does the new camera not have sound? I could "imagine" your dialogue with the critters, but wasn't getting anything. Pooh! I love the spotting on Lucy's back! How unusual to see.